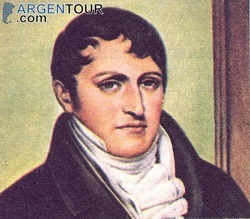 On June 20, 1820, Manuel Belgrano died in Buenos Aires in complete poverty. Although he had been a decisive figure in the independence process, and he had spent all his capital on the revolution, only one local periodical covered the news of his death. Years later, in 1938, it was decided that the anniversary of his death would be celebrated on Flag Day, since Belgrano was the first to fly the Argentine flag, an event that took place in the town of Rosario in 1812. Manuel Belgrano was a firm believer of ideologies of the May Revolution. He defended the city of Buenos Aires from British attacks in 1806 and 1807 and he became a General to the troops that achieved the Argentine declaration of independence under the command of General San Martín. He also promoted trade, culture, rights and education in Argentina. Martín was an Argentine military leader whose campaigns were decisive in gaining Chilean, Peruvian and Argentine independence. Along with Simón Bolívar, he is considered one of the most important liberators of Spanish colonization in South America. 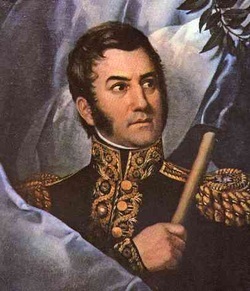 He was born in Argentina, in Yapeyú (in the province of Corrientes) and between the ages of five to thirty four years of age, he lived in Spain, where he began his military career actively fighting against Napoleon's troops, for which he was decorated and promoted to the rank of lieutenant colonel. At that time, he contacted revolutionary groups hoping for American independence and in 1812 he headed for Buenos Aires to collaborate in the emancipation of the Americas. After the battle of San Lorenzo, he was placed in charge of the Army of the North, which was always under heavy attack from Lima royalists. San Martín designed a plan for liberation by attacking Lima by sea. First having to cross the Andes Mountains, the plan helped defeat royalists in Chile earning Chileans their independence. Later, he moved toward Lima, where with the support of local armies, he successfully ousted the viceroy and achieved independence for Peru. San Martín is not only an important figure in the history of Argentine independence, but also in that of the independence of the entire Cono sur. On August 17th, Argentines celebrate The Passage of Immortality of San Martín, commemorating the day of his death. A monumental mausoleum holds the remains of General San Martín in the Cathedral of Buenos Aires.